This is the personal homepage of Johan Hidding. I'm a PHD student astronomy at the Kapteyn institute at the University of Groningen. My research interests are: cosmic structure formation, the cosmic web, (computational) geometry. In particular I study the Zel'dovich and Adhesion approximations to the formation of the Cosmic Web. My main collaborators are: Rien van de Weijgaert (promotor), Sergei Shandarin, Gert Vegter, and Bernard J.T. Jones. On this page you can find several things either having to do with astronomy or not. A poster on structures in the Local Universe, featuring the Perseus-Pisces supercluster! If you like it, here is a high resolution version (33MB). My talk "the Phase-space Geometry of the Cosmic Web" on the QU3 symposium. There is almost no text in the slides of this talk, this is compensated in the above paper. 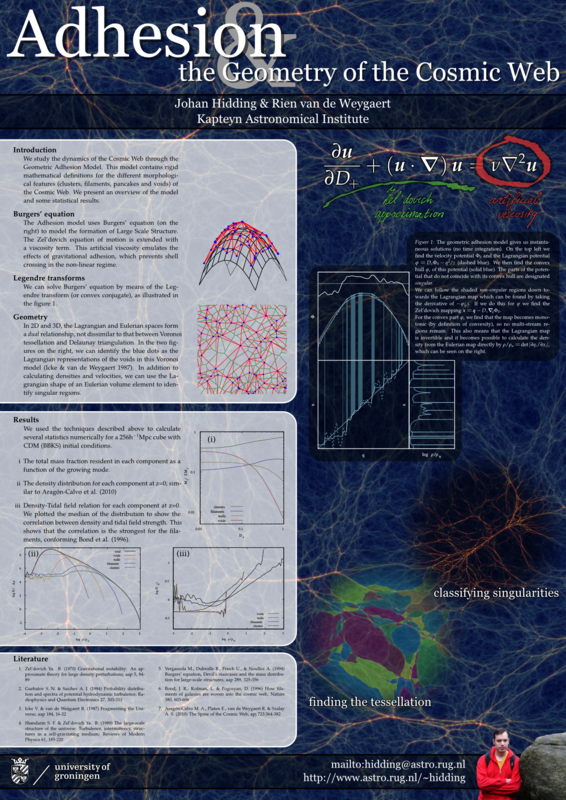 Adhesion poster, a poster on the Adhesion approximation as presented on the 4th KIAS workshop on cosmology. Large scale structure, my masters thesis blog. On the amount of dark matter in the Universe, a website I made during my bachelors for Actueel Onderzoek. In this movie I show how the adhesion model can be computed using a weighted Voronoi tessellation. The equations describing the Zeldovich approximation are identical to this system in geometric optics. The slab of glass has some minute deformations, which are made visible with a collumnated beam of light and a projection screen. As the slab moves upward, the deformations grow and caustics are formed. This movie was made with Blender and LuxRender. I've been playing the piano for some time. A few years ago I discovered singing was much more fun. I'm currently singing tenor in the Bragi a-capella choir, vocal ensemble Cantatrix as well as more irregular projects that cross my path. Bragi - *the* student choir of Groningen directed by Rein de Vries. Cantatrix - an ambitious choir operating in the northern part of the Netherlands with Geert-Jan van Beijeren Bergen en Henegouwen. Slotkoor - one week of ultimate musicians heaven at Sloß Seehaus under the leadership of Fokko Oldenhuis, featuring sunny Bavaria, a private chappel (with organ), plenty grand pianos, delicious foods from our own chefs, eternal happyness, and German beers and wine. Allthough I do most of my programming in C++ and Python, I've a dilletante curiosity in more aestheticly pleasing languages like Scheme. At the moment I'm also learning the ins and outs of D, supposed to be C++'s successor. If you have ever done serious C++ coding the way its meant (using STL containers, iterators, standard algorithms and templates) you will know the kind of frustrations that drove people to design D. Recently a majority of C++0x features are supported by the latest GCC compilers, giving some of the power of scheme to C++. There are some things that I made that could be considered remotely usefull. These are gathered somewhere else. Abelson and Sussman video lectures on programming. This is not just a course in programming LISP, but teaches a lot of wisdom in programming in general. A good reference for R6RS scheme. Python Everything you need to start programming Python is here. The language, tutorials and documentation. Python is the easiest, most powerfull and most readable language I have ever used. This has two good reasons: it has a huge standard library (batteries included) and indentation is a syntax element which forces you to write readable code. A book on classical dynamics. Dimensions - a series of beautifully rendered movies on four dimensional geometry, fractals and topology. LinuxCommand.org Teaches about the GNU/Linux command line.